It’s a festive holiday pattern in Tribe-friendly colors, perfect for the Christmas season or throughout the year. 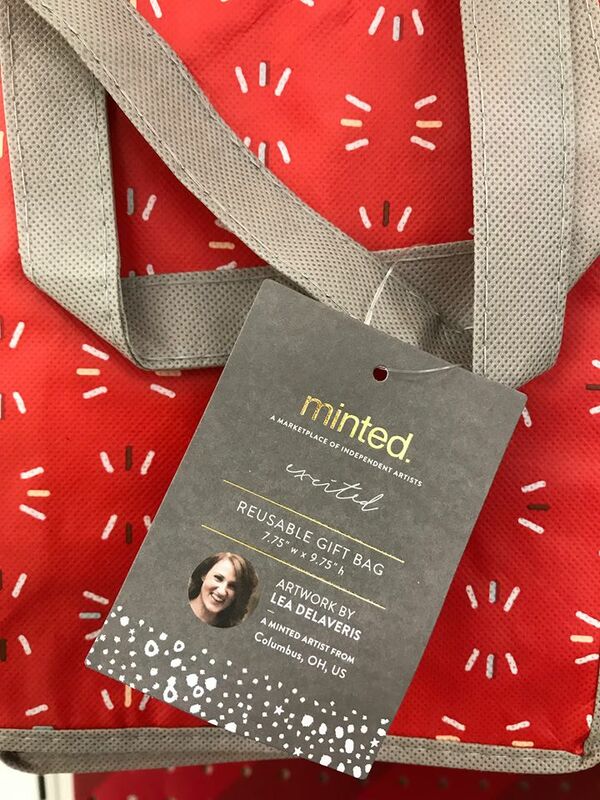 Already in some Target stores across the country - and soon to be on the shelves of others - is a series of reusable gift bags by Minted, one sporting the design of Bridgeport’s own Lea Sellas Delaveris. Now living in Columbus with her husband Lee and their two young sons, Delaveris received word in late-October that her custom burst design had been selected for purchase by Minted for the featured product. 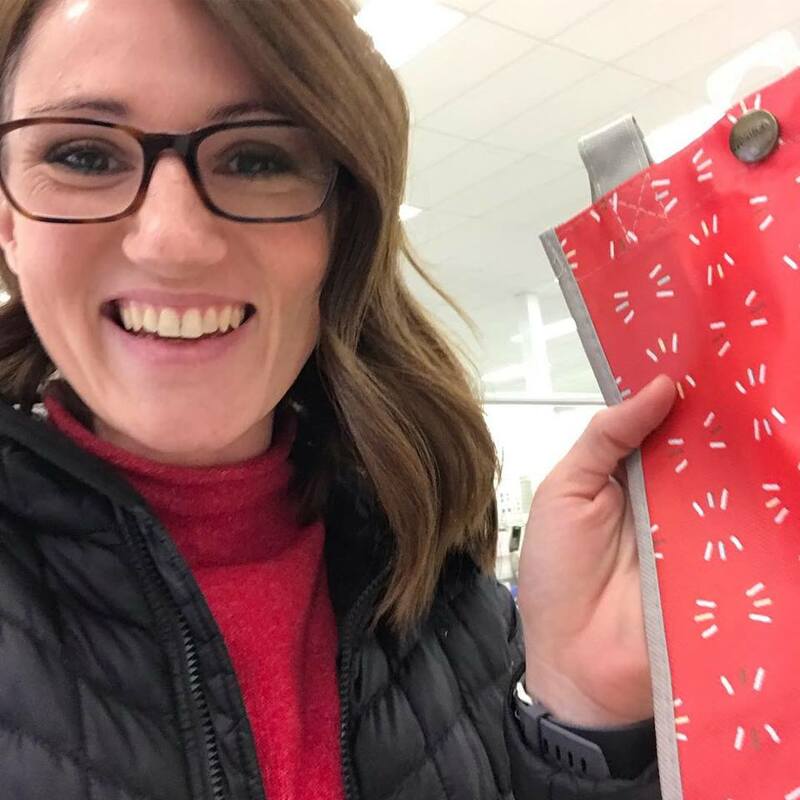 “I had created the design back in February when Minted was looking for holiday-themed patterns for wrapping paper,” she said. That would have been cool, but for the design to appear on fabric gift bags that will be carried through the calendar year is a best-case scenario. A former graphic artist/page designer, Delaveris has been associated with Minted – an online marketplace of independent artists and designers - since 2010. “The way Minted works is you submit designs to their contests, then customers and other designers vote on those. They take the highest vote getters, but also an in-house editorial board picks designs they like and think would sell well,” she said. Those designs are used in stationery, wall art, décor and other products. “My biggest success has been with stationery and related products such as announcements and holiday cards. This year, one of my designs is featured in this month’s Martha Stewart Living magazine in an ad,” Delaveris said. Though that design work is more of her forte, she said she likes to explore and dabble in other areas, such as the burst pattern design she created earlier this year. That design, as well as others she may create in the future, are simple patterns, said Delaveris, who uses Adobe Illustrator and an iPad Pro with Apple pencil as design tools. Being part of the Minted community is about more than seeking success as a designer, Delaveris said. She said she discovered Minted by accident. “I saw on Facebook where a company was giving away free address labels and saw that readers could design for them,” she said. Wanting to stay home with her two little boys Steven and Dean, she was interested in utilizing her creative talents and took the challenge of entering some contests. Over the past eight years, she has submitted several designs and made some good friends. She said she has taken trips to retail stores to take photos of Minted boxed card sets which include a photo of designer friends. Now, her products, accompanied by her photo, are in Target stores. She still can't believe it. A Minted display will be in the greeting card section of each participating Target and the trio of reusable gift bag designs will be available for purchase at check-out. The other two designs, she said, feature Santa Claus and holiday animals. She is a 1999 graduate of Bridgeport High School and the daughter of Steve and Irene Sellas. She is a graduate of Ohio University and formerly worked for the Exponent Telegram in Clarksburg and the Columbus Dispatch. Read a 2015 Connect-Bridgeport story about here HERE.